Mission Statement: Doctor Noize inspires creativity, curiosity and character through music, art and words. It's always a treat when someone as appealingly childlike as Cory Cullinan (a.k.a. Doctor Noize, and the voice/musician behind musical monkey Phineas McBoof) puts together an album for children. There's a lot packed into this fifteen-track CD, a rock opera that follows the adventures of the eponymous monkey. What follows is a fun romp through various types of music (funk, jive, country, classical, futuristic) as Phineas puts together a band, one member at a time, featuring all four corners of the world: The International Band of Misunderstood Geniuses. Melissa Eva Miller babble.com, "for a new generation of parents"
Doctor Noize is the alter ego of Cory Cullinan, who was raised in Silicon Valley and had an idyllic childhood until a dramatic series of events inspired him to grow up quickly and apply unusual focus and purpose to his young life -- the subject of one of his Keynote Addresses. Cullinan graduated with Distinction and Honors in Music and Political Science from Stanford University. Soon after, his album My Oyster earned accolades for having the free spirit of an indie release but the production values of a major release -- a blueprint he would follow upon becoming Doctor Noize. He then wisely married up, and a live recording of his marriage proposal song Something (For Janette) to his college sweetheart lead to placement of his songs in TV shows and mainstream movies like Brad Pitt's Spy Game and commissions for documentary film scores. Teaching high school music and coaching soccer at Silicon Valley's Pinewood School, he made an immediate and lasting impact on his students. His popular classical music history course was made a requirement for all freshmen; his music composition and production class released eight full albums of original songs created by kids in the recording studio he built for the school; he conducted his students in fully staged musical theatre productions like Sondheim's Into The Woods; he led the Pinewood Singers to win the Best Overall Choir award at Disneyland's multi-state Music In The Parks competition, earning the only perfect score from the judges while competing against schools ten times Pinewood's size; and he coached the Varsity Boys Soccer team -- who hadn't won a league game in 7 years -- to a winning record. Cullinan was named Pinewood's Arts, Communication & Technology Department Head in just his second year teaching. After the birth of his two action/adventure superhero daughters Sidney and Riley, Cullinan's passion became creating engaging works for the minds of young adventurers. He released The Ballad of Phineas McBoof, his first recording under the guise of his alter ego, Doctor Noize. Within two months, it had spawned a national #1 hit song — Banana — on Sirius XM Kids Radio and scored awards ranging from a Parents Choice Award to being named one of Dr. Toy’s 100 Best Children's Products. Then came the completion of Doctor Noize’s first book, The Ballad of Phineas McBoof. Like the recording, the book tells the tale of the great monkey Phineas McBoof and his quest for the impossibly perfect song with his band, The International Band Of Misunderstood Geniuses. Doctor Noize began playing live performances, engaging enthusiastic audiences of kids and adults nationwide with his totally innovative Solo Show approach inspiring audiences to participate in the creative process. He cheerfully arranges, plays and loop-records multiple instruments and vocals live, inviting audience members to join him onstage and contribute their own talents. He also combines his music and teaching backgrounds into acclaimed Genius Camp Workshops and Keynote Addresses across the country -- including writing, recording, and publishing complete songs online with participants in 90-minute song workshops. Subsequent Doctor Noize albums have continued to communicate his belief that kids are the most adventurous, creative, and brilliant audience in the world. The Return of Phineas McBoof and its companion book introduced the first operatic/orchestral Doctor Noize track with opera superstar Nathan Gunn. Grammaropolis featured the Top 10 national hit Welcome To Grammaropolis, and took kids deep into the world of words through Doctor Noize's trademark story- and character-based teaching techniques. Many popular animated videos have been created of his songs. 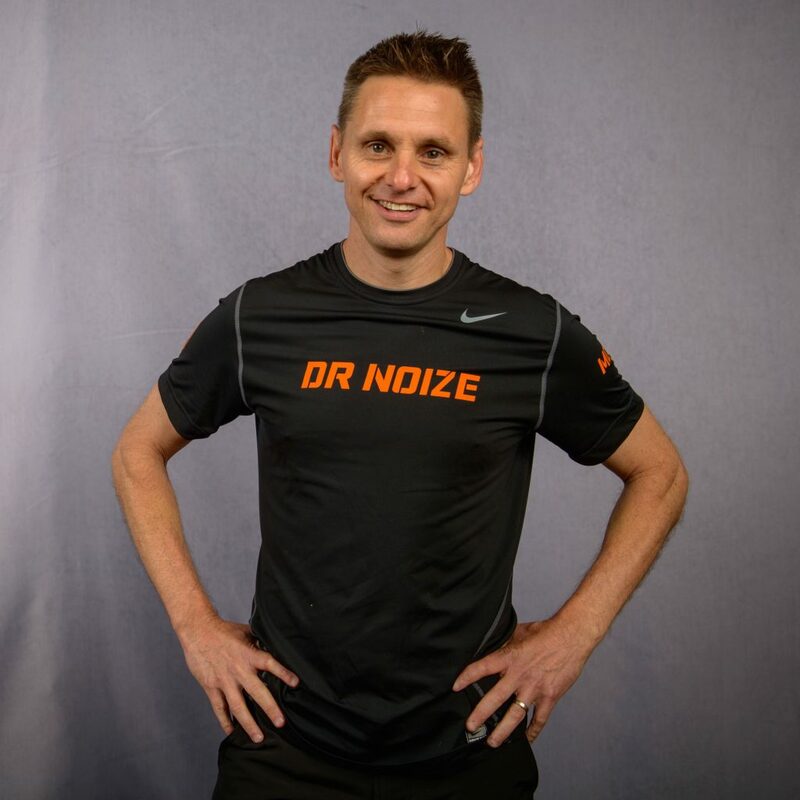 As the CEO and Creative Director of the newly expanded Doctor Noize Inc., Doctor Noize's multimedia line expanded to include mobile apps, online games, and educational curriculums. Doctor Noize's iPhone app game, Bananas! -- based on his hit song -- charted Top 25 in over 25 countries around the world and was downloaded more than 300,000 times. His second app, The Ballad Of Phineas McBoof Interactive Book, brought kids deeper inside the book with narration, songs, pages in motion, and the opportunity to remix your own version of Doctor Noize's theme song. The Grammaropolis songs are featured in the popular educational app Grammaropolis; likewise for the later app accompanying Punctuate This! The Doc's degree in classical music and dedication to the fine arts were called upon when he received a commission from the McConnell Foundation to compose and perform a live orchestral work for kids with California's North State Symphony. These groundbreaking performances with full symphony orchestras, repeated with orchestras from Alaska to Missouri, inspired sold-out shows in 2,500-seat halls and lead to the recording of Doctor Noize's dream project -- a 2-Act, 2-album musical introducing listeners of all ages to the world of the orchestra called Phineas McBoof Crashes The Symphony. Featuring the City Of Prague Philharmonic Orchestra under the baton of Kyle Pickett, a cast featuring Grammy-winning opera stars Isabel Leonard and Nathan Gunn, and jazz saxophonist Anton Schwartz, the recording was hailed with universally glowing reviews by over 100 publications nationwide and called "an essential edition to any collection" by the School Library Journal. Funding was achieved via a successful Kickstarter Campaign that raised over $110,000 both on- and offline and drew a feature article in the European Business Review, and it was a top seller on the nation's largest independent online music retailer for half a year after its release. To complete the Symphony album and his expanding productions, Cullinan turned his attention to designing, building and opening his dream recording studio: Reach Studios. Reach is a place he can create and share the things he loves most -- it's a professional five-room composing and recording studio, it's a teaching facility, and it's an indoor soccer turf training field and fitness facility. Production of all Doctor Noize and Cory Cullinan creations is now anchored at Reach, but it's also open to visiting artists to record in a comfortable and inspiring creative setting and students to learn with Cullinan as producer or teacher. Next, Doctor Noize's first commissioned work for children's theatre, the live theatrical work The Ballad Of Phineas McBoof, premiered at Palo Alto Children's Theatre to an acclaimed 11-show run and packed houses. Based on his first two Doctor Noize albums and books, this show lead to four more children's theatre commissions within the year: the music to East of the Sun, West of the Moon; a live theatrical version of Grammaropolis; the music to the stage adaptation of the New York Times Bestseller The Pout-Pout Fish; and both the book and score to an updated, modernized version of Sleeping Beauty. Finally came a sequel to the hit Grammaropolis album called Punctuate This! -- the Doc's most comical recording to date -- and 11 accompanying animated song videos perfectly timed for a world where even the President of the United States cannot tweet punctuation correctly. And in late 2017 came Doctor Noize's signing with Hollywood publisher Number 1 Trax as a composer, and the announcement that he would be devoting more time to musical theatre commissions and work for film, TV and multimedia, and less time as Doctor Noize. "I'll still be playing my favorite Doctor Noize shows -- but I won't be playing 80 shows in 8 states like I did the last five months. I'd like my own kids to remember my name when they go to college." Through it all, Doctor Noize has remained fiercely true to his indie musician educator spirit. He's a family man first who considers himself a purposeful parent and educator creating adventures for kids that inspire them to stretch, grow, learn, laugh, and create lives of purpose and ambition for themselves. He believes every kid is capable of great sophistication and purpose -- even if our culture increasingly enables or unconsciously endorses less than that. He encourages kids to reach with a smile -- Zooglobble writer and NPR family music commentator Stefan Shepherd called Doctor Noize "the funniest guy in kids music, and that's saying something." So that's it. We hope you thought this bio was even better than Tolstoy's War & Peace, but a lot shorter. Well, a little shorter. Thanks for reading the Doc's story. Now go make one of your own. The CEO, Creative Director & Performing Artist of Doctor Noize Inc.